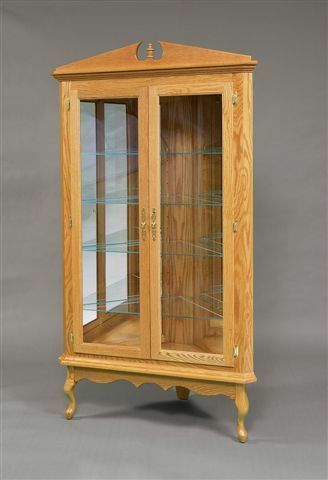 Brighten the corner of your dining room or living room with the Amish Queen Anne Corner Curio Cabinet to showcase your collectibles. Make use of good space with this elegant curio. Bring your antique tea cups, thimbles or family heirlooms out of storage and onto the glass shelves for everyone to see. From the featured crown to the cabriole legs, this Queen Anne curio cabinet utilizes gentle fluid lines and graceful curves. Queen Anne style furniture indicates a sense of occasion in any room it's featured in. Review our popular blog post, Curio Cabinet of Curiosities for creative ways to use your Amish made curio cabinet. Call us today, toll-free at 866-272-6773 with any questions.